It is my sincere understanding that God has always wanted to walk with those who were created in His image. From the beginning of the creation of man, YHWH walk with Adam and Eve in the garden. As they commiserated with Him, they were naked and unashamed. Before their willful sin, they enjoyed unhindered fellowship with God, but after the fall, the relationship between God and man had changed; fellowship would be hindered. From that time forward, a blood offering would be needed to cover the sin of the one who desired to walk with God, until the blood of Christ would be offered once for all. Some, who honored God’s call to atonement, walked with God with great success and their lives bore the mark of that relationship; which is holiness, where by they set themselves apart from the world around them. The world regarded these people as different, as God’s own. These few who were friends of God, were persecuted by the world. The first of these was Enoch, who was so fixated on God that the scripture reports “Enoch walked with God; and He was not (found), for God took him” (Genesis 5:24). This means that Enoch was translated directly to heaven, at a very young age (365 years) compared with those of his generation and even his offspring (his son Methuselah, his grandson Lamech and his great-grandson Noah). Although we have understand that Methuselah and Lamech were godly, Noah is where we see the results of the previous three men’s commitment to walking with God who alone is holiness. Noah, was the last righteousness man on earth, and he walked with God, sticking out like a sore thumb in his generation. In his walk with God, he obeyed some outrageous commands, such as building an ark, in the middle of a region with not large bodies of water, before rain had ever fallen and would not fall for another 120 years (Genesis 2:6). Noah’s work itself would be a rebuke against the world’s population concerning their wickedness against God (Genesis 6:5). 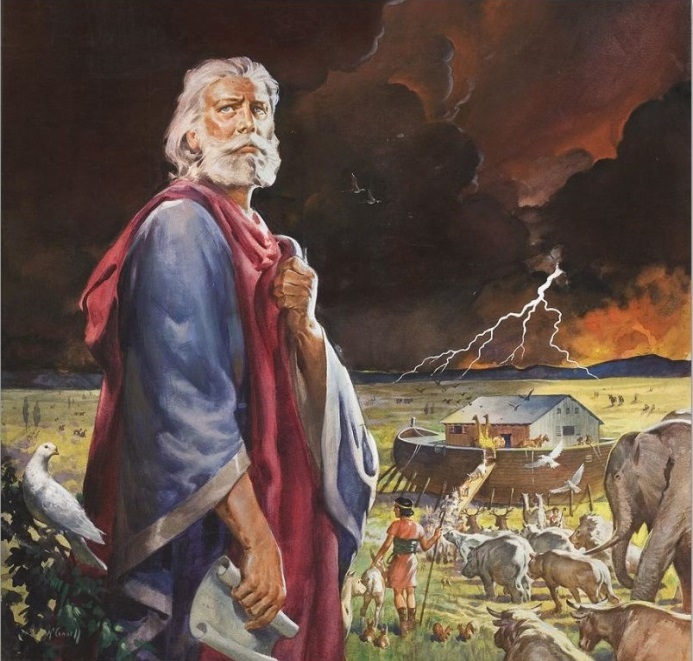 Like his great-grandfather Enoch, Noah would be “taken” out of the world (as it perished) through the ark. Noah walked with God, set apart from the world, with no compromise. 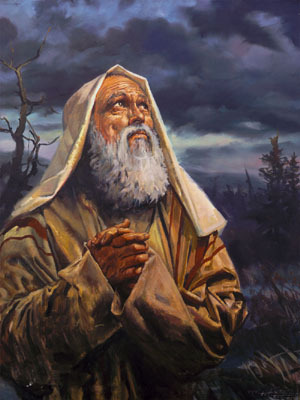 Of course after the flood, things once more got drastically bad, yet God had reserved a man named Abram, whom the LORD would later rename Abraham. His walk with God begins in earnest in Genesis 12:1-4, where out of no where God speaks to Him. Genesis 12:1-4 ​ Now the Lord had said to Abram: “Get out of your country, From your family and from your father’s house, to a land that I will show you. I will make you a great nation; I will bless you And make your name great; And you shall be a blessing. I will bless those who bless you, And I will curse him who curses you; and in you all the families of the earth shall be blessed.” So Abram departed as the Lord had spoken to him, and Lot went with him. And Abram was seventy-five years old when he departed from Haran. Let’s note a few things about Abraham’s walk with God, which concern our topic of “Be holy, for I am holy”. In the first place Abraham was called out of darkness into the light of God. We have not indication that God had ever spoken to Abraham before. Historical documents will tell us, Abraham live in Ur of the Chaldean’s. Abraham lived in the anti-God pagan capitol of the world. Jewish tradition would relay that Abraham likely an astrologer in the vein of the Magi, but when he looked at the stars he saw that there could only be One true God. Once more this is Jewish tradition and he subsequently rejected the multiplicity of god’s his culture worshiped. What we know for sure is that Abraham heard YHWH’s voice and walked away from all he had ever known, to follow the only true God, whom he just heard for the first time! Secondly we see Abraham believed he was hearing from the one true God, because he moved away from his world, his culture and his own preferences. This leads us to the third and very important aspect of Abraham’s walking with God… it changed his disposition, thinking and behavior. When reading through Genesis account of the life of Abraham–we see him obey God–make rash decision’s with potentially disastrous consequences–obey God again–make more rash decisions–hear God concerning His promise and be accounted as righteous for his faith in God–exhibit great compassion for the potential loss of righteous lives, while he intercedes with God concerning the destruction of Sodom and Gommorah–we see the promise realized in Isaac. We finally witness Abraham’s faith and love for God above all other people, including Isaac, when he was going to kill the boy, at God’s command. The point to this recounting is to highlight that Abraham was not holy in himself, but he obeyed God’s call to set himself apart from Genesis 12:1-4. In setting himself apart, Abraham interacted with the God who is HOLY. Even though his relationship to God was intimate, it was not what we have in Christ, yet interacting with God changed Abraham forever. In a very similar fashion, God has called us to walk away from our old lives and set ourselves apart, in our call to “Be holy, for I am holy”. 2 Corinthians 6:14 – 7:1 Do not be unequally yoked together with unbelievers. For what fellowship has righteousness with lawlessness? And what communion has light with darkness? And what accord has Christ with Belial? Or what part has a believer with an unbeliever? And what agreement has the temple of God with idols? For you are the temple of the living God. As God has said: “I will dwell in them and walk among them. I will be their God, and they shall be My people.” Therefore “Come out from among them And be separate, says the Lord. Do not touch what is unclean, and I will receive you.” “I will be a Father to you, and you shall be My sons and daughters, Says the Lord Almighty.” ​ Therefore, having these promises, beloved, let us cleanse ourselves from all filthiness of the flesh and spirit, perfecting holiness in the fear of God. I suggest you spend some quality time in a season of prayer over this passage. For the sake of time, I want to focus on God’s call in Christ “Come out from among them and be separate says the Lord“. In this we can see, like Abraham, we are called to leave behind the world, the flesh and the devil; we are called to cleanse our lives from anything which defiles our spirit cleansed and sanctified, by Christ’s shed blood. In doing this we are walking with God. Similar to how God’s holiness transformed Abraham, as he walked with God, so in new relationship to Him, our lives ought to be transformed; that transformation will not ultimately look like the life of Abraham, but that of Christ Himself (Romans 8:29; II Corinthians 5:21). In his relationship to God, Abraham was considered a friend of God; we in our walk are considered God’s son and daughters. Our walking with Him is also different in that God would appear to Abraham in some form of His manifest presence (in human form or glory). We have the benefit of the indwelling presence of Abba, with the potential to be filled with all His fullness (Romans 8:14-17; Ephesians 3:14-21). Therefore, our walk with God, produces a holiness that transforms us from the inside out. This is only a guaranteed promise for those who obey His command to “Come out from among them and be separate“, with all our hearts. My hope is that the practice of walking with God, a His way to “Be holy, as I am holy“, relieves you of some of the anxiety associated with the call. Remember that God has His part and we have ours. If we can leave behind the world, the flesh and the devil, He makes it as easy as letting Him lead the walk; we simply learn to hear Him and yield to His moving in and through us. For the person who has committed to walking away from their old life, this is less difficult than we tend make it (Romans 6:11-13). That being said, the absence of full commitment to walk in holiness, is without a doubt the one of the biggest drags on the church in America. Without holiness we can not expect God’s manifest presence among us, or to have true discipleship or ministry in the power of God’s Spirit. Let us commit to simply obey God’s call to be what we are in Christ… holy! This entry was posted in Baptism in the Holy Spirit, Be Holy, for I am holy, Genesis 12:1-4, holiness, I Peter 1:13-16, II Corinthians 6:14-18, Uncategorized. Bookmark the permalink.